During an investigation of light curves from the MACHO project (Alcock et al. 1999, see also Bernhard 2011 and Huemmerich, Bernhard 2012), MACHO 118.18538.194 (2MASS J17593845-2933218; tabulated coordinates were drawn from the 2MASS catalogue, Skrutskie et al. 2006) has been identified as a potential eclipsing symbiotic binary. The star exhibits periodic eclipse-like dips in brightness which vary considerably in amplitude, from 0.3 to 2.2 mag in V and 0.3 to 1.9 mag in Rc (see the light curve). The regularity of this feature implies that the observed dips are in fact eclipses rather than pulsations or R CrB or UX Ori-like fadings. The two-component nature of the system is clearly demonstrated by the variation in colour through the cycle as the hot component is obscured during the eclipse (see the light curve). The star's classification as an eclipsing system is further supported by the large degree of consistency in the light curve outside eclipse. which places MACHO 118.18538.194 in the middle of the period range of symbiotic systems. There is considerable variation in the eclipse but this is all contained within the eclipse envelope and is entirely consistent with a very wide wind-wind eclipse model. The opening angle of the boundary cone must be ~90 degrees as obscuration occurs out to phase 0.25. The light variations are most likely due to variations in the mass transfer rate from the cool component. The longer-term variation in the eclipse depth also points to large-scale variations in the mass-loss rate of the cool component. It seems most likely that the eclipses are entirely due to obscuration and scattering in the wind as there is no evidence of a true eclipse of the hot component but only of the cool one. The observed light curve properties and colour measurements from 2MASS (J–K=1.412) are in agreement with the star's classification as an eclipsing symbiotic binary. In general, the light curve of MACHO 118.18538.194 is remarkably similar to those of other symbiotic systems, such as e.g. V5569 Sgr, whose eclipse amplitude also varies strongly (see e.g. 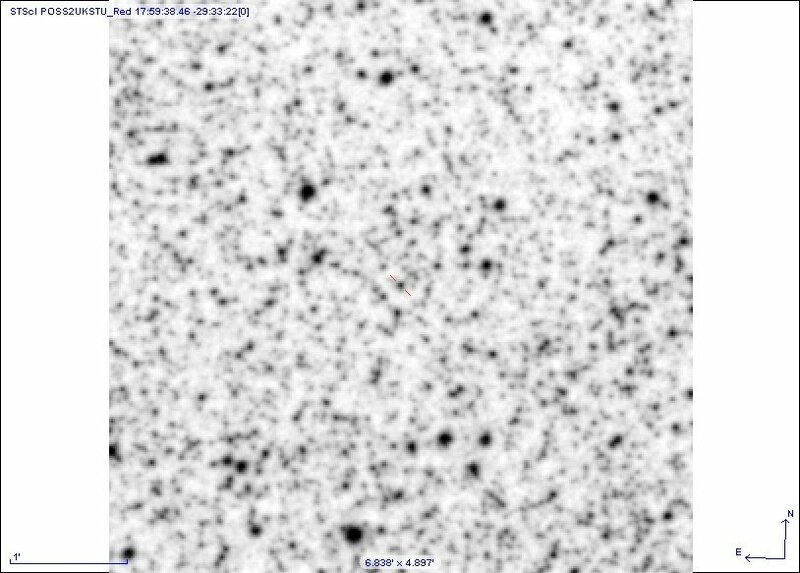 V5569 Sgr's ASAS-3 light curve, Pojmanski 2002). However, in contrast to V5569 Sgr, the out-of-eclipse magnitude of MACHO 118.18538.194 has remained remarkably constant over 7 years. The star is also listed in the RCB-enriched catalogue of Tisserand (2012), who shows that mid-infrared colour-colour cuts are a viable and efficient method of identifying possible new R Coronae Borealis (RCB) variables. The fact that MACHO 118.18538.194 shows similar mid-infrared properties to RCB stars is a strong evidence for the existence of a circumbinary shell in the system. 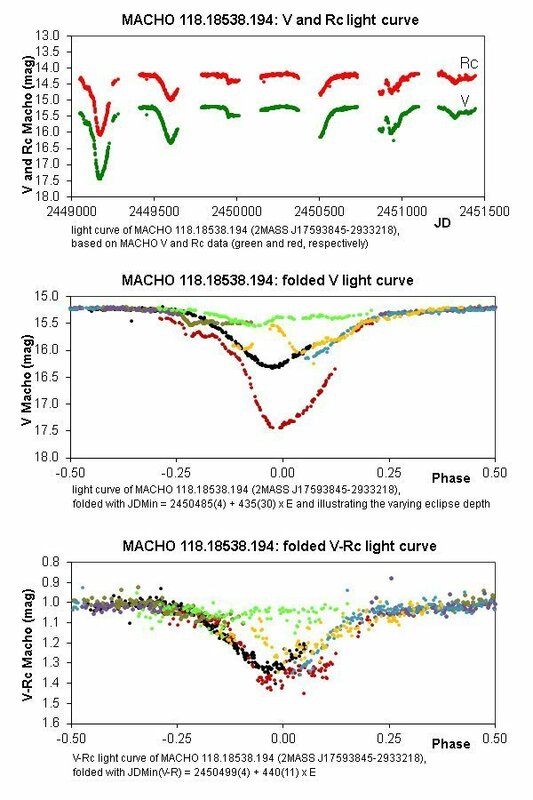 To sum up, we conclude that MACHO 118.18538.194 is a promising symbiotic binary candidate and encourage further photometric and spectroscopic observations to reach a conclusive classification.